The revolving door that surrounds the quarterback position this season due to the large number of injuries, has made it difficult to gage which WR orTE will thrive under their replacements. Some examples will follow in this week’s waiver wire pickups below, none of which are owned in more than 12% of leagues as of Tuesday, Nov. 5, 2013. 1. 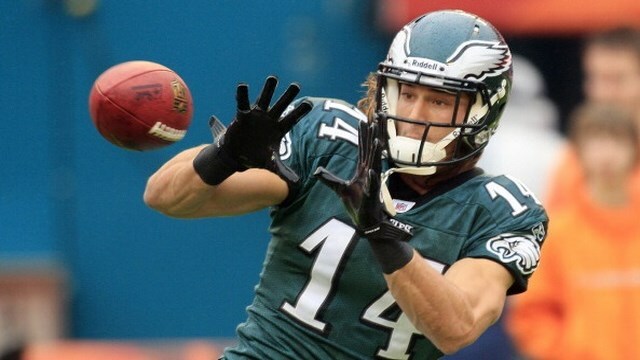 Riley Cooper-WR-Eagles- 11% Owned- Clearly Nick Foles’ favorite target, Cooper has flourished when Foles has been under center. In his few starts at QB while Michael Vick has been out with an aggravated hammy, Coop has 12 receptions for 291 yards and 3 TDs. After throwing a league-tying 7 touchdowns last week (Vick threw just 5 TDs in his six starts), it wouldn’t surprise us if Foles stays on at QB for the rest of the season. 2. Tim Wright-TE-Buccaneers- 12% Owned- Bucs QB Mike Glennon has made Wright one his most targetted receivers. In his last two games, Wright has 12 targets, more than average for most TE’s, with 106 receiving yards, and 2 touchdowns. Glennon has shown a high comfort level in and has a good rapport with Wright, and understands how a TE can prove to be a young QB’s ‘best friend’. For those of you without Jordan Cameron this week (bye), Wright could be the ‘right’ pickup for you. 3. Rashad Jennings-RB-Raiders- 9% Owned- With Darren McFadden re-aggravating his hamstring, Jennings filled in and had 15 carries for a season high 102 rushing yards and one touchdown. He also had 74 receiving yards for those in PPR leagues. Jennings will continue to be the starting RB this week when the Raiders face a Giants team with some noted defensive flaws. 4. 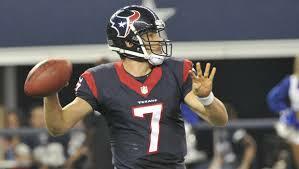 Case Keenum-QB-Texans- 10% Owned- Matt who? It doesn’t appear like the Texans nor their fans miss Matt Schaub all that much since Keenum took over as quarterback. Keenum had four touchdown passes and no interceptions in two starts against Kansas City and Indianapolis, one- and three-point losses to division leaders. He’s averaging 10.5 yards per attempt and his rating is a top-ten 118.0. Keenum makes an excellect pick up this week! 5. Doug Baldwin-WR-Seahawks- 12% Owned- With Darrelle Revis on Golden Tate and Sidney Rice out of Sunday’s game vs Tampa Bay, Baldwin found himself in a perfect spot. He had a season high 10 targets, 9 receptions for 75 yards, and a touchdown. We wouldn’t normally list him as a pickup for this week except the Seahawks are going up an Atlanta team in disarray and one that is generous to slot receivers such as Baldwin. I’m not gonna lie. I would never play fantasy football. Not because I’m so thoroughly invested in my team that I couldn’t bring myself to root for another, no. It’s because fantasy football would only serve to magnify the chasm between my team and professional football. But I dig that Keenum out of Houston. He’s fun to watch. Yep, I totally agree. Keenum has made the majority of Texans fans forget about Matt Schaub. He’s a keeper!! BUT… I did pick up Case to fill in for Rodgers… Nice little hometown boy, so we’ve been happy to see him do so well. Just hearing the news about Tony Dorsett and CTE today. Sad stuff. What you described is the downside of Fantasy Football. When someone on your fantasy roster is playing against the team you root for, it can get a little frustrating. When you’ve been at fantasy sports for as long as we have you just get used to it. As for Keenum, nice pickup! Have you seen this kid play? He’s sooo exciting to watch. He should be around for a while assuming that Schaub doesn’t get to start again.